It’s kind of surprising we don’t see more Pikmin-style games on PC. The beloved Nintendo franchise has inspired a handful of games (such as last year’s Masters of Anima), but the format is still vanishingly rare on PC. 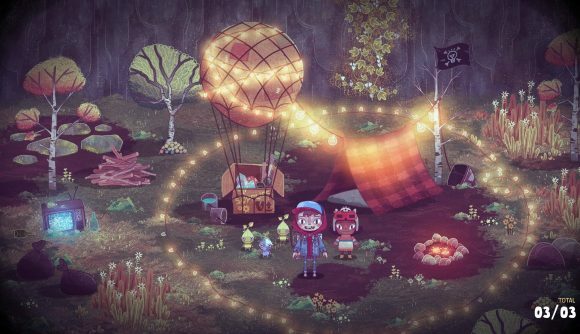 The Wild at Heart is a game that openly embraces its Pikmin roots, and it marries the core gameplay idea of leading a troupe of cheerful little plant people with gorgeous artwork that could have come out of a storybook from my childhood. You play as 12-year-old Wake, a boy who sews patches on his denim jacket and likes spending time alone. Trouble at home has Wake spending more and more time outdoors, exploring the forests and streams of his hometown of Willowvale. Along with his little neighbor Kirby, Wake is led into the forest by a strange creature one night, which is where the adventure begins. It’s a combination of the picture books and movies I loved as a kid – there’s some Neverending Story in there, and the style reminds me of something I can’t quite put my finger on, somewhere between Maurice Sendak, Tove Jansson, and Richard Scarry. It’s the art that really sells me on The Wild at Heart, but that adorable horde gameplay borrowed from Pikmin looks promising as well. The game’s world is rainy and distinctive, full of detailed characters. There’s a mysterious order in the forest who are the sworn defenders of nature, one of whom wears a deep-sea diver’s helmet made from a tea kettle. Your goal is to guide your army of sprites, who look a bit like little onion people, through the world and enlist their help in overcoming obstacles, defeating enemies, and crafting items all to help the Greenshield order fight back some evil force called The Never. The Wild at Heart also has the kind of retro sensibility you may have seen in Stranger Things, which is another piece of recent media that reminded me rather intensely of my own childhood. I suppose part of what makes this work is that I have nostalgia for the same things and the same era as these creators do – Wake’s jean jacket and Ghostbusters proton pack are instantly recognizable to me as artifacts from my youth. There’s no set release date for The Wild at Heart yet, and it’s being created by a small development team called Moonlight Kids. It’s one I’ll definitely be keeping an eye on.